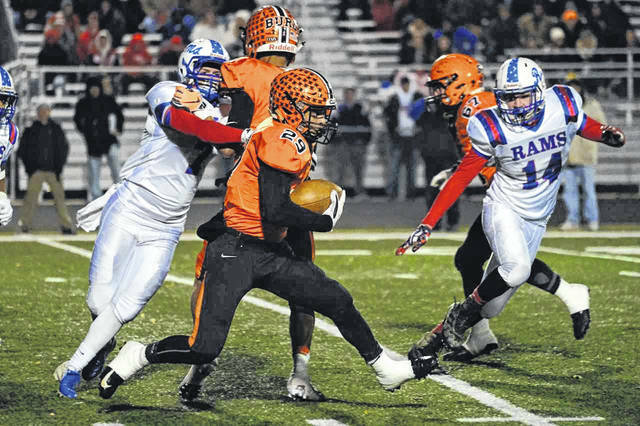 Tanner Holden caught a screen pass for a 61 touchdown in Wheelersburg’s victory over Greeneview Saturday night. Wheelersburg junior playmaker Makya Matthews had a total of three touchdowns in the Pirates win over Greeneview Saturday night at Herrnstein Field. The Jamestown Greeneview Rams gave the Wheelersburg Pirates absolutely everything they had Saturday night at Herrnstein Field in Chillicothe, but still ultimately fell short to the defending Division V state champions in cold conditions, 35-13. Wheelersburg tried setting the tone early at Herrnstein Field by kicking an onside kick on the opening kickoff which was recovered by none other than the kicker, Jalen Miller, himself. However the Pirates were unable to do anything with the ball on their first possession of the game but did happen to pin Greeneview inside their own ten yard line on their punt attempt. After forcing the Rams to punt following a three and out, it was time for the Makya Matthews show to take over as the playmaker has had the tendency to do over his junior season. Matthews picked up the punt after a few bounces from around midfield and proceeded to fly up the Wheelersburg sideline and into the endzone for a 50 yard punt return for a touchdown to give the Pirates the 7-0 lead with 7:05 to play in the first quarter. On the Rams next possession, they were able to march down the field thanks to the play of their quarterback Nick Clevenger and his offensive weapons but were ultimately forced to take a 36 yard field goal with 2:50 left in the first quarter to cut the Wheelersburg lead to 7-3. The next possession for each team resulted in an interception near the goal line, giving Wheelersburg the ball with a chance to build on their lead. Thanks to the outstanding speed and athleticism of their senior wide receiver Tanner Holden, the Pirates were able to do just that. Holden caught a screen pass from senior quarterback Trent Salyers and decided a medium gain wasn’t good enough, going the length of the field and finding the end zone for the 61 yard touchdown reception with 7:14 left in the first half to put Wheelersburg ahead 14-3. However, unlike most teams that fell prey to the Pirates this season, the Rams punched back against the explosive Wheelersburg offense. On their ensuing drive facing a 4th and 1 at the 10 yard line of Wheelersburg, running back Clay Payton took the handoff from Clevenger and scampered in the endzone untouched to cut his team’s deficit to 14-10 which would remain the score going into the half. Coming out of the halftime break, Matthews continued his excellent play by taking the opening half kickoff to the Wheelersburg 45 yard line. To cap off their 55 yard scoring drive, Matthews carried the ball into the endzone at the 8:47 mark of the third quarter to give the Pirates the 21-10 lead. Again, where most teams would have folded, Greeneview responded. When they needed points, the Rams got the ball into scoring position and ended up with points on the board as Jon Brakeall nailed his second field goal of the game, this time from 38 yards out to cut their deficit to 21-13 with 3:49 left in the third quarter. After a costly turnover and turnover on downs respectively by Wheelersburg and Greeneview, neither side was able to get any points on the board for the next quarter plus. Until, that is, Makya Matthews was able to avoid Greeneview defenders and coast up the Wheelersburg sideline for a 30 yard touchdown rush with 2:33 left in the game to give the Pirates the 28-13 lead. Just for good measure, following an interception by Matthews to the Greeneview 45 yard line, Evan Horsley broke free for a 45 yard touchdown rush, his first of the game, to close the books on the game and give the Pirates the 35-13 regional semifinals victory over a tough Greeneview team at Herrnstein Field. Matthews, who was undoubtedly the difference maker in all three aspects of the game had another career game for his team Saturday night. The junior playmaker had 311 all-purpose yards, three total touchdowns, an interception, three tackles from his safety position, and a pass deflection as well. Following their victory, Wheelersburg advances to the regional championship where they will face Middletown Madison Senior. The Pirates defeated Madison a year ago in the state semifinals at Herrnstein Field in Chillicothe 15-10, so needless to say the Pirates are very familiar with Madison as a team that returns most of their players from a season ago. In the last AP poll of the season for Division V teams, Madison was ranked second in the state, while the Pirates were ranked third. The location of the regional final is still to be determined but will be announced by the OHSAA sometime on Sunday afternoon. No matter the location, it is certain the Pirates will square off against the Mohawks in a rematch from a season ago next Saturday night at 7:00 p.m.